Like diabetic foot ulcers, Charcot foot is one of the many complications that can arise from nerve damage caused by diabetes. The nerve damage, also called peripheral neuropathy, leads to a loss of sensation in the feet and can throw off one’s sense of balance, which can raise the risk of injury. Such injuries, when occurring repetitively over time, can cause the weight-bearing joints to break down. In severe cases, it can even lead to a total collapse of the foot. With time, the foot may take on an abnormal shape and make walking increasingly difficult. The condition is often detected well into the late stages, sometimes when damage is so severe that amputation is necessary. This is unfortunate, as detecting Charcot foot early on can allow clinicians to properly treat the bone damage. Casts are generally used to help the bones heal, after which point special orthopedic footwear may be utilized to protect the bones after they’ve healed. Sometimes, surgical correction is necessary to stabilize the foot. The biggest problem with Charcot is the lack of awareness. The American College of Foot and Ankle Surgeons warns that, due to low sensation in the foot, diabetics with neuropathy are less likely to notice sensations of pain or recognize trauma to the feet. They may experience a breakdown of the joints and continue walking on the damaged foot without realizing they have the condition, thereby worsening the situation. As such, people with diabetes need to be more alert to the possibility of damage to the feet and be on the lookout for symptoms of Charcot foot. The lack of sensation in the feet causes one to be unaware that they may have Charcot foot. People think they don’t have a problem because they feel no pain, but that isn’t the case. Anyone at risk for neuropathy, including diabetics, alcoholics and some chemotherapy patients, should see a foot and ankle surgeon early and at least once every year, even if they are considered low risk. Detecting the condition early on is the key to minimizing damage, deformity and the risk of amputation. For that reason, knowing and being on the lookout for signs of Charcot foot is essential. In the first stage of Charcot foot, you may experience swelling, redness and warmth in the feet. X-rays may show swelling in the tissues as well as joint dislocation and bony fragmentation. 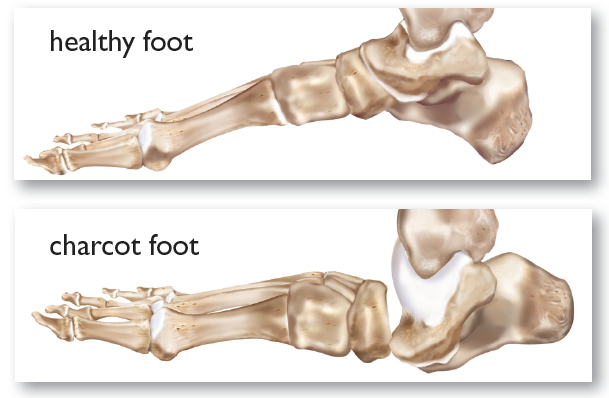 If untreated, fractures or dislocation may occur, causing severe deformities if the ankle, hindfoot and midfoot arch. In the second stage of the condition, these symptoms may decrease as the damaged bone begins to heal on its own. However, as the foot heals and enters the third stage of Charcot foot, there will be residual deformities that may make it difficult to walk and require extreme medical intervention. Heightened awareness can help people with diabetes avoid additional complications, such as foot deformity and amputation, caused by Charcot foot. Anyone who notices a difference – discomfort, unexplained swelling or redness, or changes to the shape of the foot – should seek care right away. If you are concerned about Charcot, come and see the experts at Capital Foot and Ankle.